Unfortunately tens of thousands of badgers are killed or injured every year on Britain's roads, and for many humans this is the only occasion they may see a badger. They may wish to provide assistance. Firstly a warning! Badgers are potentially dangerous animals with sharp claws and teeth. They also have thick skulls, and may appear to be dead when only unconscious. In this situation they may become fully awake without warning, and if cornered or startled could attack - potentially very dangerous if on the back seat of your car at the time!! The safest option for handling involves the use of specialist equipment by someone trained in its use. 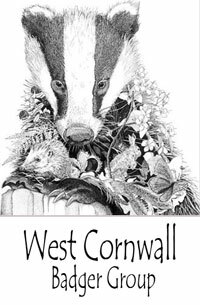 Unfortunately West Cornwall Badger Group does not have the resources to offer a badger rescue service. Cornwall Badger Rescue specialise in the rescue, treatment and organise the rehabilitation of injured badgers in Cornwall and their subsequent return to the wild. They operate a 24hr a day 7 days a week - all year round. They are all volunteers and receive no govenment funding. Please report animals in distress to the RSPCA on their emergency number not the local centre. Do please remember that at busy periods it may take a long time for your call to be answered. Hang-on, you will be answered.